Co-op to jump & brag about your scores! The sky’s your only limit with Angel Birds Jump, the first ever co-op enabled “ascent platformer” adventure! Download this kinetic game & see how long you’ll last bouncing from platform to platform, going ever higher today! Choose to do solo quest or have co-op fun, just don’t fall! Endlessly addictive and exhilarating, Angel Birds Jump improves on the game dynamics of classic ascent platformers. Lightning fast gameplay and arcade-inspired obstacles including broken, moving, and disappearing platforms all work to push player’s reaction times and hand eye coordination to their limits. If this wasn't enough players are faced with unique enemies & opportunities to collect special bonus items as they play, ensuring gameplay is always exciting and fresh. Perhaps even more unique though is this game’s co-op enabled gameplay option. Connecting their iOS devices via Wi-Fi or Bluetooth friends can play Angel Bird Strike together, with both of their characters appearing on screen together. This is an innovation that not only changes the gameplay dynamics of this frenetically delightful arcade adventure, but one that gives team players a better chance at getting higher than they’ve ever gotten before when playing solo! On the technical front Angel Birds Jump is a well-rounded title as well, complete with beautifully rendered graphics, versatile app features/ support, in-depth gameplay manual for new users, and sporting a highly responsive user interface. The app offers full iPhone/iPod Retina Display and iOS 4 support, including multitasking capability as well. In addition to all of this, the game is well integrated with Facebook and Twitter, as well as offering Openfeint online leaderboard support. With this all in mind it seems its high time you step up & experience the next generation of platform jumping games. 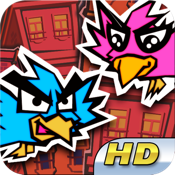 Don’t hesitate, step up, get set, and ready to play because Anger Birds Jump has arrived! •Broken, moving, disappearing platform obstacles. •Unique whimsical enemies for players to get past. •Many collectable in-game bonuses, power-ups, and special items. •First-of-its-kind two-player live co-op mode. •Full iOS 4 support including multitask. •Wi-Fi and Bluetooth enabled multiplayer capability. •Multiple unique enemies and special items. •Full player manual for novice gamers. •Players can play using their personal iPod/iPhone BGM’s.